Big Thunder Mountain Railroad is a Disney Parks roller coaster that can be found at may theme park of their theme parks worldwide. 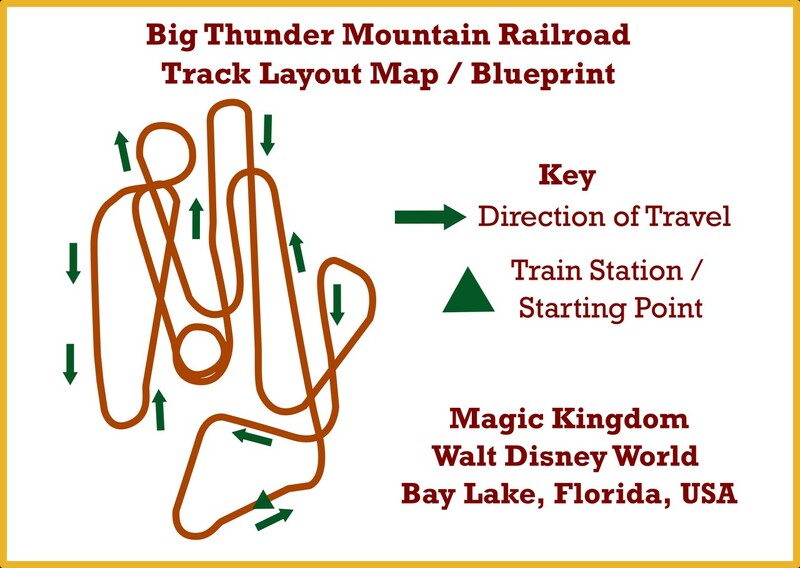 In this article we cover the Big Thunder Mountain Railroad map and location of the ride for the version that is found in Frontierland at the Magic Kingdom, Walt Disney World Resort, Bay Lake, Florida. Big Thunder Mountain Railroad is located in Frontierland at the Magic Kingdom in Walt Disney World. The ride is located on the east side of the park. From the front entrance of the Magic Kindom you head down Main Street U.S.A. toward the Walt Disney and Mickey Mouse statute at the center of the park. At the center of the park you then head toward the upper left pathway to Liberty Square. From Liberty Square, make a left towards Frontierland and Splash Mountain. From Splash Mountain, make a right. Big Thunder Mountain Railroad is straight ahead. The line / queue entrance is also straight ahead. Another option to get to the location of Big Thunder Mountain Railroad is to take the split to Adventureland, head towards the end and then make a right. Above Big Thunder Mountain Railroad Map at the Magic Kingdom in Walt Disney World originally by OpenStreetMap Contributors. Photo modified by NavFile. 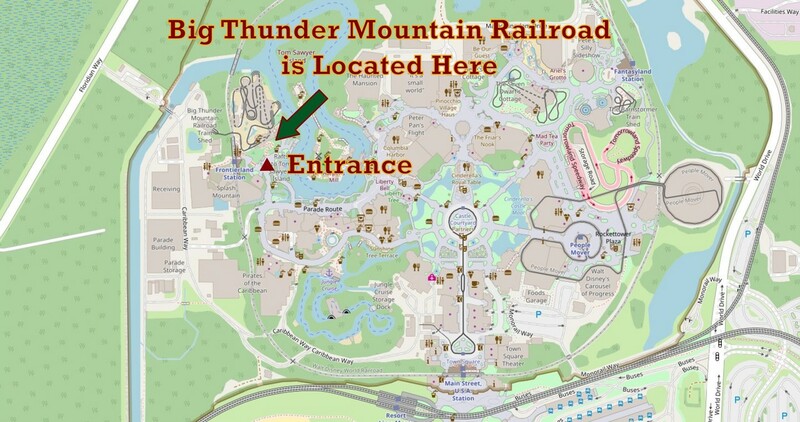 Our team has put together the following Big Thunder Mountain Railroad map and listed some of the popular map applications, like Google Maps, with the attraction highlighted. The map above shows the location of Big Thunder Mountain Railroad (BTMRR) in the Magic Kingdom. The maps below also show where the attraction is on some popular map sites/programs. Below is a Google Map for the ride. You can interact with the map and have it open in the Google Maps app on your smartphone (Android or iPhone). Walt Disney World Resort’s website and mobile apps have the official map for Big Thunder Mountain Railroad. The interactive map for the attraction can be found on their website at this location. If you prefer the printed style of map that can be found in the Magic Kingdom, you can view the map, in Portable Document Format (PDF), on their website here. You will need a PDF viewer like Adobe Acrobat to view that version of the map for the ride. If the link to the PDF map does not work, you can go to the Magic Kingdom page on their website to find the link. It is usually on the left side of the page and it says “Magic Kingdom Guide Map”. Also, their mobile apps called MyDisneyExperience also have a built-in map that will show the location of Big Thunder Mountain Railroad. You can learn more about the apps on the Walt Disney World Website here. We have created a map of the actual track layout for the ride. You can see on our track layout and blueprint page and learn more about the track layout for the ride. It is also featured below. Above Big Thunder Mountain Railroad Track Layout Map or Blueprint by NavFile. You can learn more about Big Thunder Mountain Railroad at Walt Disney World by visiting the other pages that are here on the site. More on the rides and attractions at the Magic Kingdom can also be found in our Magic Kingdom section.